There are three main menu options: Home, Events, and Contact Us. The Home menu lacks submenus. The Events menu does have a submenu consisting of Event 1, Event 2, and Event 3. 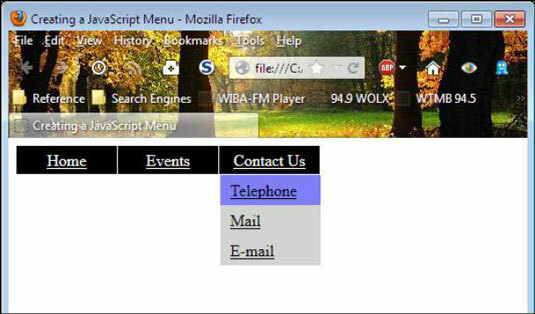 The Contact menu provides Telephone, Mail, and E-mail as submenus. This CSS code is presented in the order of detail. The #menu formatting is for the topmost <ul id=”menu”> tag. The main menu items are formatting in turn by the #menu li and #menu li a styles. When a user hovers the mouse over a main menu item, the #menu li a:hover style changes the background color to green. The submenu formatting is accomplished by the #menu ul and #menu ul a styles. Again, when the user hovers the mouse over a submenu item, the #menu ul a:hover style defines a color change for that menu item. // Holds the current open menu item. // Holds the timeout value. // Hide the menu after clicking outside it. The Item variable contains the current menu item. Timer holds a value that determines when a submenu will close automatically. If you don’t provide this value, the menu behaves quite erratically, and users may find it difficult to select items. Finally, the code must provide a means to automatically close menu items when a user clicks outside the menu system, which is what the document.onclick = CloseMenu assignment does. // If there is an item that is open, close it. // Obtain an item reference for the new menu. Notice that the code first checks to ensure that the previous submenu is actually closed. Otherwise, the user could see two open submenus, which would definitely be confusing. After the code makes the previous submenu hidden, it makes the current submenu visible. In both cases, the example relies on the visibility property to perform the task. // Set a timer for closing the menu. // If the item is still open. When the application requests that a submenu close, the code creates a 500 millisecond delay, after which the window automatically calls PerformClose(). When an item exists, PerformClose() sets its visibility property to hidden to hide the submenu from view. As long as the user hovers the mouse over the submenu, it will remain open because the timer is constantly reset. The moment the user moves the mouse off the submenu or clicks one of the submenu items, the timer restarts, and the submenu closes.